What distinguishes social scientific research from common sense is that social scientists approach information and knowledge in a systematic and consciously articulated way. They use rules and procedures about how to build and apply theories, how to design studies to test hypotheses, how to collect data and use them as evidence, and how to evaluate all forms of knowledge. The start of the research process requires a gradual narrowing of the field. A topic has to be chosen, concepts have to be defined and the aims of the research have to be clearly specified. The process of choosing a topic or area to research will be influenced by one of several factors that usually interrelate. In practice, researchers come to a field of study already constrained by many factors. They bring with them their personal concerns. They may be part of a research group where the topic is already defined and the project is under way. They are likely to be working with a particular set of theoretical assumptions by virtue of their location – in time and in a culture, a society, a particular university, and a particular interest group. Certain types of research question are fashionable; some attract funding, some do not. Researchers generally already have ideas about what would be an appropriate theory. In other words, they have preconceptions about the nature of people, people’s behavior, what would be a suitable question, and what would be acceptable evidence. What all this means is that research is done within a context that is made up of assumptions about the subject matter and the ways in which it should be studied. This kind of context is called a paradigm. Researchers have to ensure that research is relevant and establish what research has already been done on the topic by examining the existing literature. This helps to ensure that they do not unintentionally repeat what has previously been done or found to be a dead end. This question is does not, for example, distinguish whether we should look for parts of the brain that are associated with memory, or consider the mental strategies that facilitate memory, or investigate the social and emotional motivations that make it more likely that we will remember some things rather than others. This question serves to guide us towards using the technique of brain imaging in an experimental setting – recording images of brain activity whilst the research participants try to remember either familiar or unfamiliar words. It is then possible to formulate a hypothesis (a testable claim) about the relationship between brain functioning and memory for words. We may, for example, hypothesize that more areas of the brain will be involved in remembering familiar compared with unfamiliar words. Then we have to work out exactly what is going to count as a familiar, as opposed to an unfamiliar, word; for example, 20 of the most frequently used nouns used by pre-schoolers (e.g. cup, boy, door) as opposed to jargon words that are only used in a highly-specific profession (e.g. deixis, anaphoric, antonymy). We also have to work out how the raw data of the brain images will be interpreted and how they will be used – will it be a comparison of locations of activity or a measurement of the extent of brain activity? This process of defining concepts and making them useable in practice is called operationalizing the research problem. Many areas of social science require that researchers generate hypotheses before they start the process of research investigation. These are usually the areas of speech therapy and the traditions where research is already well-established. But in a new area or in a tradition where exploration and detailed description is itself the research goal, research begins without specific hypotheses. Charles Darwin’s work of describing, cataloguing and categorizing species is an example of research in what was at the time a new area, before any theory was devised and therefore without hypotheses. Since that time, his theory of evolution has generated many hypotheses which have been tested. 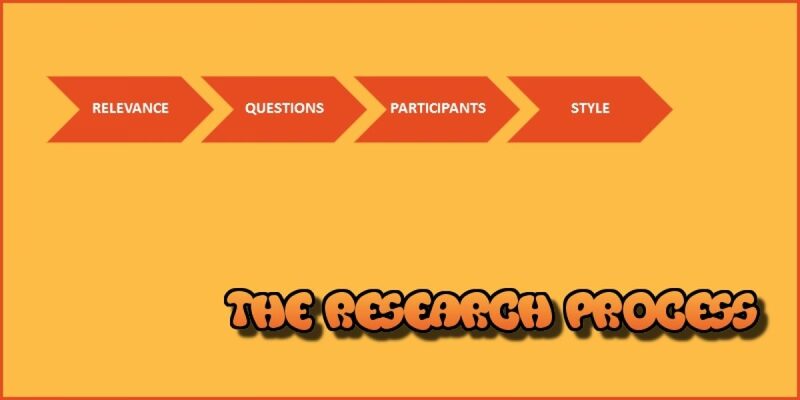 Once the research question has been devised and the problem operationalized, researchers then need to decide on the people they are going to include in their research – the participants. For the ‘memory for words’ question mentioned above, the possible population for the research could be everyone in the country and it is obviously impossible to study them all. It is, therefore, necessary to work out what the sample should be. The researcher may, for example, have negotiated permission to ask for volunteers from a particular school. She or he may then define the sample as ‘one volunteer in every 20’, chosen at random. Since the volunteers will be undergoing brain imaging, each participant would be brought into the specialist hospital for access to the imaging technology. For this study, it is clear that brain imaging will be the method used to collect data and the data will be the actual images produced, although these images have to be read and interpreted and converted into evidence. The example above uses direct imaging which is a neuropsychological technique, but it is used as part of an experiment (i.e. comparing the effect on brain activity of hearing familiar and unfamiliar words). The most commonly used social scientific research styles are experiments, surveys (questionnaires and interviews) and ethnography (fieldwork observations). The research process starts by isolating a sufficiently specific and answerable question. In some studies, it then involves choosing an appropriate method(s) which will provide data to test the claim or the hypothesis underlying the research. Some research projects do not begin with a specific question or a specific hypothesis but are about understanding meanings. The most commonly used social scientific methods are experiments, questionnaires, interviews, standardized tests, observations, and meaning and language-based methods. Social science research is conducted within a paradigm – a framework made up of assumptions about the subject matter and ways it should be studied, the methods and data that are considered to be legitimate.